SIMPSON BAY, St. Maarten (January 23, 2014) Princess Juliana International Airport, SXM, has won the International Award for Business Leadership in Image & Quality, granted by the Global Trade Leaders’ Club headquartered in Madrid, Spain. The award ceremony was held on December 2, the eve of the 70th Anniversary of the airport. It was attended by Mr. Raul van Heyningen, Director of Air Traffic Services at SXM Airport and member of the Supervisory Board of Directors, Mr. Cleavland Beresford, who both received the trophy on behalf of management and the board. “It was indeed an honor and privilege to be part of the Princess Juliana International Airport team in Madrid, to receive the prestigious award given to PJIAE for its leadership in Image and Quality performance during 2013,” said Beresford. “The management and staff of the PJIAE deserve a tap on their shoulders for their hard working contribution which resulted in the achieving of the award,” he added. Beresford explained that the “successful 40,” as the group was called in Madrid, comprised of electronics, finance, manufacturing, construction, health, and maritime companies, to mention a few. “What was most outstanding was the thrilling visual presentation made by PJIAE, of wide body aircrafts landing at our unique airport here on St Maarten; this definitely was a major highlight at the presentation that will remain in the minds of all attendees. It was a good marketing tool for St Maarten,” he said. .
For his part, Van Heyningen, in his acceptance speech, noted that SXM Airport “also serves as the international airport for French St. Martin, Anguilla, St. Barths, Saba and St. Eustatius.” . “The need to constantly reinvent ourselves, improve our image and service and consequently contribute to a healthy bottom line made it necessary for us to re-brand the airport,” Van Heyningen said. 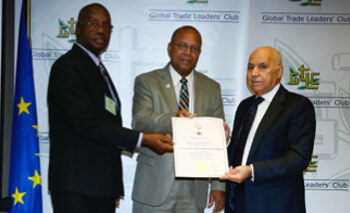 Although several airports have received awards from the Global Trade Leaders’ Club, SXM is the first airport to be granted the International Award for Business Leadership in Image and Quality, which was instituted in 1975, according to GTLC. The airport is also among a select 5% that has received an award from GTLC twice in the same year. GTLC organises the granting of several International Trophies to enterprises from all over the world as an encouragement and recognition of their work, devotion, innovation, and quality to develop the industry and trade in their own countries. “Being awarded by the GTLC allows a company to become part of an international business organisation with great communication channels to promote their brand,” the Club said. It further explained that the selection of firms is based on recommendations from companies, from all industrial and service sectors, who are already members of the club. “In fact, they send us every year their suggestions and information about the most representative firms of each sector and of each geographical area, through a survey that the GTLC conducts amongst its members. “These recommendations can also come from our web-based form, where our members regularly go to put forward new candidate companies who show strong business trajectories. All recommendations are, of course, checked, when necessary, by consulting companies, by the Chamber of Commerce, by the Business Offices of the Embassies, etc… before making the final decision on the granting of the trophy,” the Club, with some 7,500 members from over 90 countries, said. 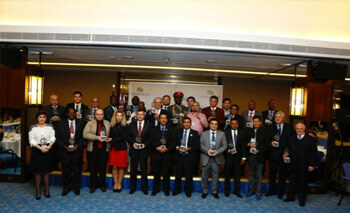 The companies that received the award this year hailed from countries such as Egypt, Portugal, Mexico, Morocco, Turkey, Pakistan, Ghana and Indonesia to name a few, in industries such as pharmaceuticals, banking, finance, architecture, distribution, mining, healthcare, electronics, aviation and more.